Staple Prime; A staple, floating 6mm pellet diet for regular Spring/Summer/Autumn feeding. 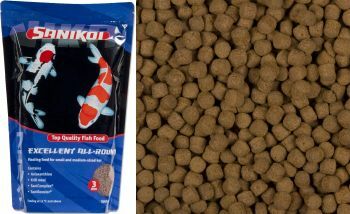 Excellent All-Round; A high protein floating 3mm & 6mm pellet diet for regular Spring/Summer feeding. Colour Hi-Grow; A 3mm & 6mm supplementary floating pellet feed with colour-enhancing ingredients. All-Season Wheat Germs; A lower protein, higher fibre 6mm floating pellet food for cold water feeding. Winter Wheat; A highly digestible sinking 3mm pellet fish food for Autumn/Winter feeding. Sturgeon Pro Green; A fishmeal based 6mm sinking protein pellet specifically formulated for Sturgeon . 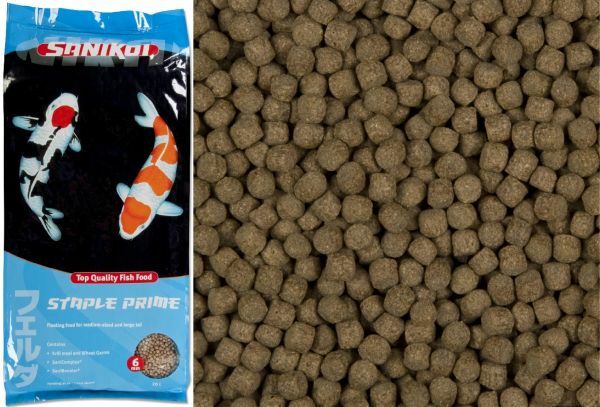 SaniKoi Staple Prime is a high quality floating pellet fish food for Koi Carp and ornamental Cyprinid fish, ideal for feeding as a staple Spring and Summer diet. Staple Prime is fishmeal based and has been composed for high digestibility and minimal waste. Ingredients consist of fishmeal, wheat, soya dehulled/extracted/toasted, wheat germs (10%), wheat gluten, fish oil, premix, krill meal (1%) and yeast. Staple Prime fish food contains SaniComplex® and SaniBooster® to aid digestion and strengthen the fishes immune system. Staple Prime is supplied in 6mm floating pellets. Available packing weights are 1600g, 3800g and 7800g. Smaller 1600g packs are supplied in a resealable bag for prolonged freshness. Staple prime is recommended for feeding at water temperatures of 12ºC and above. 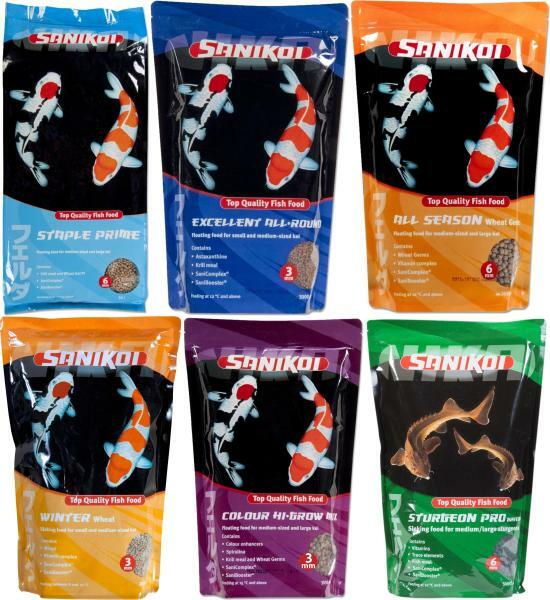 SaniKoi Excellent All-Round is a premium, high protein floating pellet feed for Koi Carp and other pond species, ideal for regular feeding during Spring and Summer. 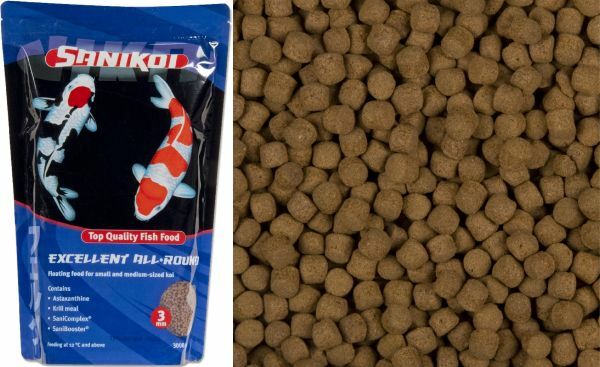 Excellent All-Round is composed primarily from fishmeal ingredients, ensuring a highly digestible, protein rich diet with minimal nutritional waste. Excellent All-Round fish food also contains Astaxanthine additive for enhanced fish colouration. Ingredients consist of fishmeal, wheat, soya dehulled/extracted/toasted, fish oil, premix, krill meal (1%) and yeast. This fish food contains SaniComplex® and SaniBooster® to assist digestion and strengthen immunity. Excellent All-Round is supplied in 3mm and 6mm floating pellets. Available packing weights are 600g, 1700g and 5500g in 3mm pellets and 500g, 1600g and 4500g in 6mm pellets. Smaller packs up to 1700g are supplied in a resealable bag for prolonged freshness. Excellent All-Round is recommended for feeding at water temperatures of 12ºC and above. 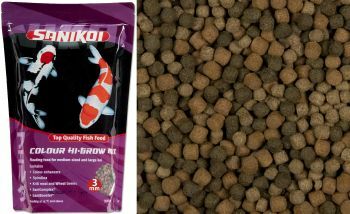 SaniKoi Colour Hi-Grow is a good quality floating pellet food for Koi Carp, Goldfish and other coloured ornamental pond fish. Colour Hi-Grow is best used as a supplementary feed alongside a staple diet fish food to enhance the red colouration of pond fish. Colour Hi-Grow ingredients are based around fishmeal with the addition of colour enhancing ingredients. This feed has been formulated to bring out the vibrant colours of pond fish with optimal nutritional conversions and minimal waste. Ingredients consist of fishmeal, wheat, soya dehulled/extracted/toasted, wheat germs (3.5%), fish oil, lucerne protein concentrate, premix, krill meal (1.5%), wheat gluten, yeast and spirulina (2%). Colour Hi-Grow contains SaniComplex® and SaniBooster® to aid fish digestion and strengthen immunity. Colour Hi Grow is supplied in 3mm and 6mm floating pellets. The available packing weights are 1600g in 3mm and 1400g in 6mm. All Colour Hi-Grow packs are resealable. This feed is recommended for Spring and Summer feeding at water temperatures of 15ºC and above. SaniKoi All Season Wheat Germ fish food is a quality lower protein floating pellet feed for Koi Carp and pond fish. 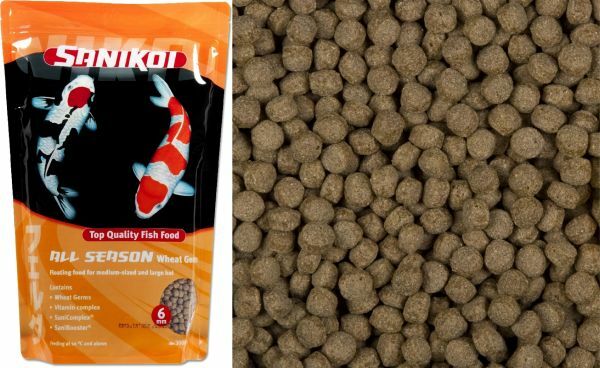 This fish food is ideal for feeding from Autumn into Winter and early Spring when water temperatures are lower. All Season is a wheat germ based pellet food which is highly digestible in lower temperatures and minimises nutritional waste. Ingredients consist of wheat, fishmeal, soya dehulled/extracted/toasted, wheat germs (10%), fish oil, premix (0.5%) and yeast. All Season Wheat Germ feed contains SaniComplex® and SaniBooster® to aid digestion and strengthen the fishes immune system. All Season Wheat Germ is supplied in 6mm pellet size, in resealable bags weighing 1300g. 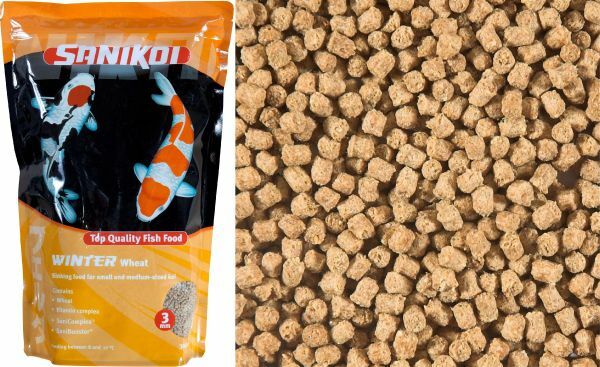 This fibre rich fish food is recommended for feeding at water temperatures of 10ºC and above. Sa niKoi Sinking Winter Wheat Fish Food. 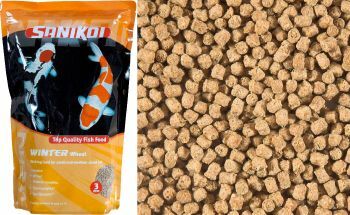 SaniKoi Sinking Winter Wheat is a wheat based sinking pellet fish food for Koi Carp and other general pond fish. Sinking Winter Wheat is ideal for feeding in colder water during late Autumn through Winter and into early Spring if pond fish are still looking for food items but are reluctant to visit the cold water surface to feed. Winter Wheat is high in fibre and is very digestible with minimal nutritional waste conversion. Ingredients consist of soybean meal (decorticated) toast, wheat, wheat feed, fishmeal, corn gluten, fish oil and yeast. 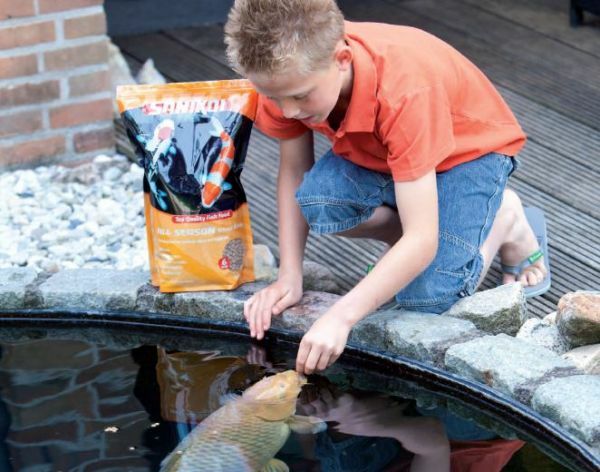 This feed also contains SaniComplex® and SaniBooster® to aid digestion and strengthen the fishes immune system. Winter Wheat is supplied as 3mm sinking pellets in resealable packs weighing 1800g. Winter Wheat is recommended for feeding at water temperatures between 8ºC and 12ºC. 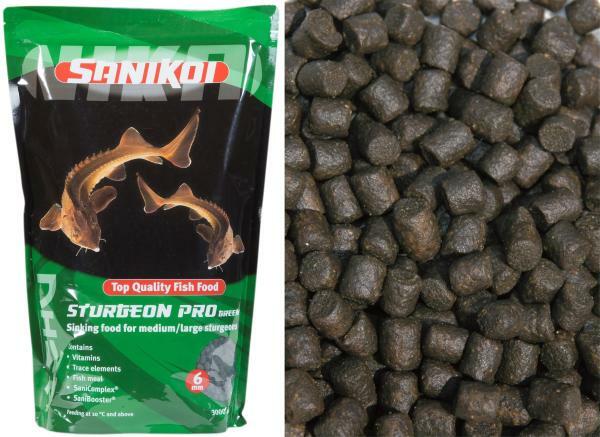 SaniKoi Sturgeon Pro Green is an excellent regular, staple feed specifically for Acipenser pond species such as Sturgeon and Sterlet. This product sinks quickly to the pond floor where Sturgeon species prefer to feed. 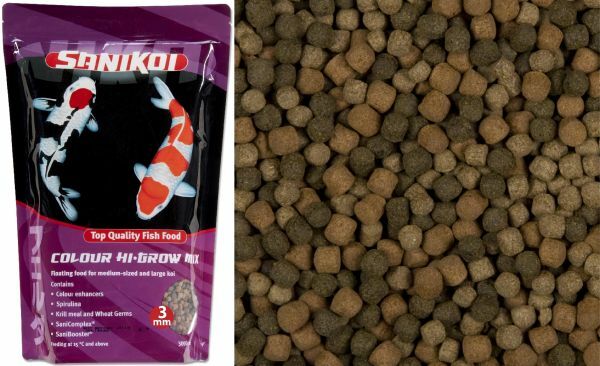 Available exclusively in 6mm pellets suitable for Sturgeon of most sizes, this feed is heavily based around fish meal and fish oils as it is these ingredients that provide the high protein/healthy fat dietary needs that Sturgeon require. Available in 2100g reseal packs and 7000g sacks. Sturgeon Pro Green ingredients consist of fish meal (around 50%), wheat, soya (dehulled, extracted and toasted), fish oils, maize gluten, animal fats, lucerne protein concentrate and spirulina with vitamins additives and trace elements for an all-round healthy diet with minimal excess waste nutrients. Supplemental SaniComplex helps digestion and SaniBooster bolsters the immune system. Best fed in temperatures at or exceeding 10˚C for best protein conversion rates. 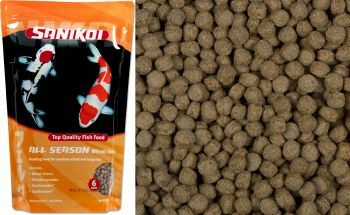 SaniKoi Koi & Pond Fish Food - Nutritional Information.